Beautiful Village House with pool, stunning sea view and minutes from the beach. Two double bedroom village house with stunning sea views and private pool. This is a real gem of a house with stunning sea views and private pool for your sole, private and exclusive use. 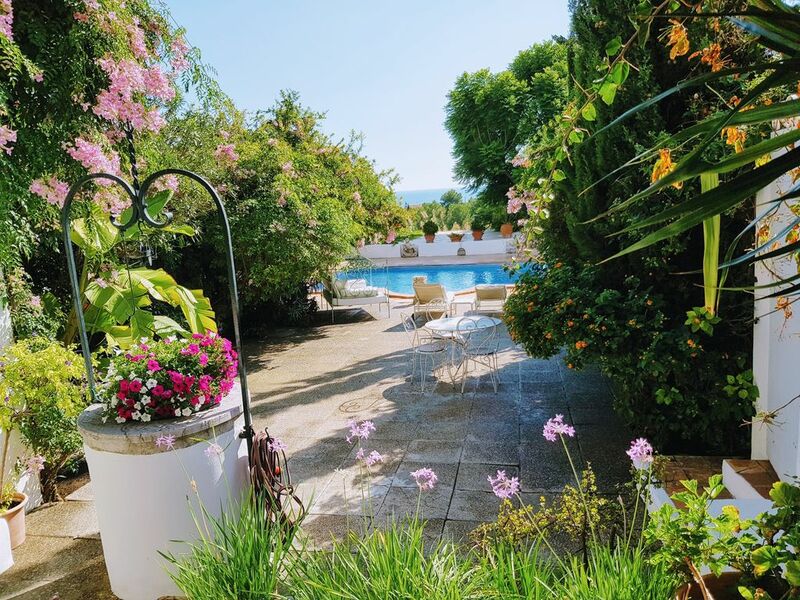 It is situated in a peaceful village yet minutes from the bustling nightlife, culture and great shopping of Palma City and very close to all the wonderful beaches nearby. The village is very sought after as it also provides easy access to reach the rest of the island and has many great restaurants. The house is decorated with great style and taste and even though it is self catering, it gives the feeling of a ´boutique hotel`. All your needs are provided for from private parking, Satellite TV, DVD/CD and WIFI Internet access. The garden, terraces and pool are completely private and not shared with anyone else, with beach towels provided allowing you to completely relax without a worry in the world. Pets are most welcome! This is wonderful place to rent in the winter as well- many people come here to escape colder climates. Winters here are mild and we have walkers, nature lovers and bird watchers and sight seers- so many beautiful cultural sights, exhibitions, old churches, art galleries, the famous Cathedral, incredible restaurants ..... all very close. Palma is very alive all the year round! 2 euros per adult per night and 1 euro per under 16 year old per night for the first 8 nights. From the 9th night onwards, it's 1 euro per adult per night and 0.50 euros per under 16 year old per night. 1 euro per adult per night and 0.5 euros per under 16 year old per night for the first 8 nights. From the 9th night onwards, it's 0,50 euros per adult per night and 0.25 euros per under 16 year old per night. I am an interior designer- and have worked extensively for 12 years on the island- you can check out my website on : www.mikush.co My assistant Heidi will deal with all your enquires. Please contact her directly. Lower part of beautiful house incorporating the garden and swimming pool for your completely private use ( there is an apartment upstairs where the owners live but they have no access to the garden and pool) The pool is private and for your sole use, but a pool boy and gardner need to have access on occasion to pool terrace and garden only to provide top quality upkeep and cleanliness for your own comfort. Beautiful village house in fantastic location with great hosts. Lovely house in Genova - very rustic and charming with wonderful and discreet hosts Claudine and Mikush. Very accessible village with a small supermarket and bakery. Palma and the coast were nearby allowing lots of places to visit close to the house. Very pleased with the house and the area it is in - we had a wonderful stay - and many thanks to the very charming hosts. The owner is incredibly helpful, the house is incredibly pretty, the swimming pool is a nice size and the location is really convenient. Thank you for your lovely review. Hope to see you again one day! Fantastic house and pool area with wunderfull view. We loved it. We just loved everything about it. The house, the pool area, all the flowers, the view, great Resturans nearby, very nice and helpfull lady upstairs and good information from Heidi about everything we needed. Perfect for our needs, a charming accommodation, with a wonderful Hostess who gave great advise on places to visit, and eat. A car is a must in this area, but many resorts and restaurants are only a short drive away. with that said don't miss out on a restaurant in the village a short walk from the apartment. Es Mussol was one we went back to three times, inexpensive, excellent menu, and with warm friendly Host and Hostess. one not to miss. Overall a great place to stay. Thank you Keith it was great having you to stay! Everything about this apartment is lovely. Peace, cleanliness, comfort and efficiency. We were met by the owner Claudine who sees to your every need. If we go back to Mallorca we will definitely try and stay here again. It is close to Palma and the sea. Although we hired a car we actually got a taxi into Palma for the evening. In the village there is a very good bakery and shop. Also we went to the tasty Meson Can Pedro which is within walking distance of the property. Must book it is very busy. I would highly recommend this beautiful property. Thank you for a memorable stay. Thank you for the lovely review. It was a joy having you to stay and we look forward hopefully one day to seeing you again! The villa itself is charming. The location in the quiet town of Genova was an added bonus. Close proximity to beaches, ports, and mountains offered a variety of fun activities. Thank you for a pleasant stay. Puerto Portals Marina and Shopping, Marineland. Palma Nova Water slides and theme parks, Puerto Adriano ( designed by Philippe Starck) . Valle de Mossa and Deia, sights made famous by The Night Manager T.V Series. Golf: Famous Bendinat Golf Course close by. Special long term winter lets available 2000 € per month inclusive of all utilities. Minimum 30% deposit required by bank transfer. Final cleaning charge 80€ always added. Rental agreement upon request. You will receive confirmation emails from me MIKUSH or my personal assistant KATE, or my mother CLAUDINE do not accept any other information, any other name or telephone number in reply to your emails.